Whether you've got a large or small dog, we care for them all at Paws Required! Your pups will be able to socialize while waiting for their service in our friendly pet salon. If your pet becomes disorderly or a customer requests, we will provide your dog with a spacious pen to relax in. Contact us today to learn about our pricing or to schedule an appointment! All products used are hypoallergenic and natural. We use the product that fits your loved one best. A special soap is used for your loved one's face with no additional charge. This soap does not cause problems in dogs' eyes and will not harm your pet if he or she were to swallow the lather. This is a fluff-up on the dog's hair before his or her haircut. We take the time to comb the hair during this service. Your dog's trimming will include the file down on the nail at no additional charge. We will cut as per your request or whatever the breed standard is. All breeds and all cuts are available. Large or small animals, both are welcome. At Paws Required, we see many dogs that are shy and timid or have gone through the process in the past and had a bad experience. Rest assured, we will soothe your dog and ensure they are calm. We are excited to have your pet here! When you bring your pooch to Paws Required for a mini groom, he or she will receive all the full grooming services with the exception of the precision cut. 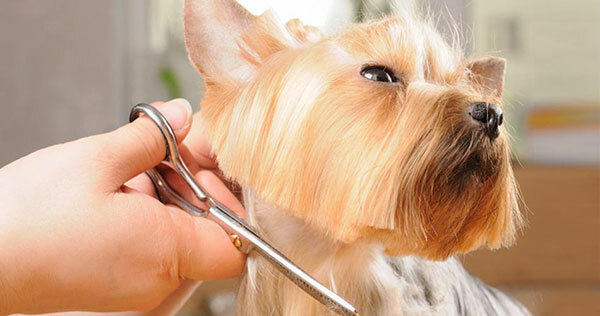 Dog grooming has become increasingly popular and it is easy to see why. For more and more dog owners in our city, their canine companions are seen as much more than a simple pet but rather like extended members of the family. If that is how you view your furry friend, then why not treat him or her to a relaxing and rewarding dog grooming treatment from Paws Required that will be both beneficial to your pet’s health and its appearance. With years of experience and a commitment to dog grooming excellence, there is no challenge too big or job too small for our team of certified grooming professionals. So, what are you waiting for? We work tirelessly to make your dog’s grooming experience as enjoyable and memorable as possible. We use the power of positivity to transform a challenging task into a day of fun-filled adventure. Our one-of-a-kind grooming experience will simply not be found elsewhere so why not treat your dog to this winning formula. Our cage-free grooming service is perfect for dogs who are being groomed for the first time or for those who are being introduced to the process and after some time away. Our team of professionally certified groomers are gentle in their approach and devoted to each individual dog that visits us. We always strive to be as considerate as possible to all our dogs’ needs and it is this attention to detail that separates us from other pet care companies in the area. Before scheduling a grooming appointment for your dog, we advise all our clients to bring their four-legged friends to us to help them get a sense of familiarity with their surroundings. This meeting also allows us to get to know your dog and select a grooming treatment that will best meet his or her needs. Once this has been achieved, we will schedule an appointment. On the day of the appointment we try to be as inclusive as possible with our treatment and this means involving you, the dog owner. Our grooming professionals will educate you on the best methods and practices so that you can understand what your dog is getting from our service. This will also help you to prepare your dog in advance of any future visits. Whether your dog needs its nail clipped or a full-body massage, there is only number to call. With years of experience combined with the most advanced grooming techniques, we can ensure that your canine companion looks and feels their best for longer. Our service is guarantee to deliver optimal grooming results. For us good is simply good enough. If you want a great dog grooming experience then you need to speak to us today. We promise, you won’t be disappointed.